“I was surprised by the number of products that are released every day (from Inventionlnd). That statistic really impresses me! My students were surprised at the endless possibilities of careers that [prepare people to] work at [innovative companies like] Inventionland. They were under the impression that they had to be an engineer only to work at a place like Inventionland, however, they learned otherwise,” said English as a Second Language and Gifted Services Teacher Anita Young. Teachers are finding Inventionland’s course materials and teacher aids to be the foundation for a curriculum that engages students and transforms classrooms. 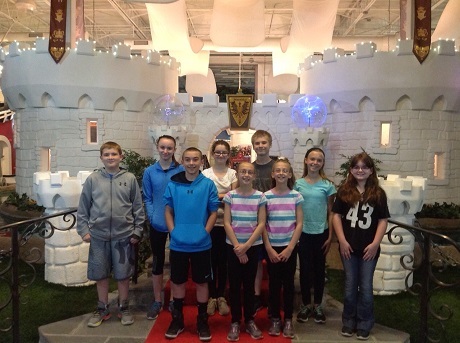 According to Young, her group’s recent visit to Inventionland not only began to infuse their excitement over STEM education, but it also left her looking for additional ways to incorporate Inventionland’s unique course material in her classroom. “I think my students will be much more driven to participate in STEM/STEAM activities. I believe they will put much more effort into creating sales pitches and focusing on marketing strategies, as well as building. I also appreciated the opportunity to learn a little more about [Inventionland’s education division]. I have already contacted my IU and Superintendent to seek more information,” said Young. According to Young, the Inventionland tour is awe-inspiring. With 16-unique themed sets at our very own makerspace, it is no wonder that Young and her students had a difficult time selecting a favorite. “As a mother, I found my favorite set to be [the Nursery Nook]. I love the fact that the area has a nursery and provides a very realistic approach to ensure the creation of good products. [I asked my students which were their favorite sets.] The first set was the Motor Speedway. The students loved that they could work on such ‘cool’ projects. The other set they enjoyed was the Brainpower Ballpark break room area. They kept saying, ‘I wish we had something like this at school.’ They liked the idea of taking a creative break to have some fun,” said Young. But, it didn’t take the bright group of students long to see that Inventionland incorporates fun into creating real-world products. If you’re looking for a new way to engage your students, while giving them 21st-century STEM skills, visit Inventionland or subscribe to our course materials, teacher resources and Professional Development opportunities. Contact us today!